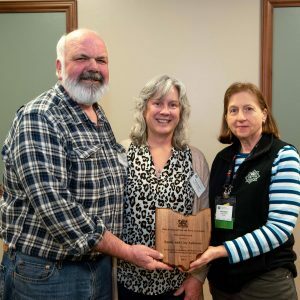 The Stewardship Award recognizes outstanding contributions to the cultivation of sustainable agriculture, the Service Award recognizes outstanding service in support of sustainable agriculture, and the Advocate of the Year Award recognizes exceptional contributions to sustainable agriculture policy advocacy. 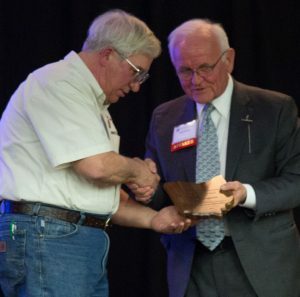 The awards are announced each year as part of OEFFA’s annual conference. 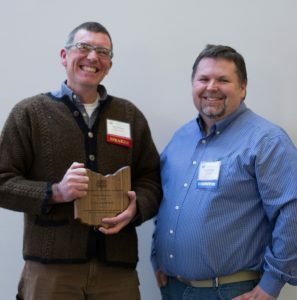 The following award winners have all played a vital role in advancing sustainable agriculture in Ohio. Guy and Sandy Ashmore, Clinton Co. Guy and Sandy Ashmore are co-farmers and owners of That Guy’s Family Farm, a certified organic 48 acre farm in southwest Ohio. They started farming in 1978 using conventional practices and raising confinement hogs. In 1988 they joined OEFFA, describing it as a “turning point in our farming practices and ultimately our lives.” Their first acres were certified organic in 1998. By 2005, their entire farm was certified organic. The Ashmores have inspired a love of farming in their children Maggie, Nellie, and Conard. Nellie manages her own business on the farm, That Girl’s Flowers, and Conard is a partner in the produce operation. Their oldest daughter, Maggie, and her husband farm in eastern Kentucky at Old Homeplace Farm. The Ashmores have also helped to train the next generation of farmers. They’ve hired apprentices since 2011 and recently started hosting apprentices through OEFFA’s Begin Farming program. They have held OEFFA farm tours, led OEFFA conference workshops, and are active members in their OEFFA chapter. 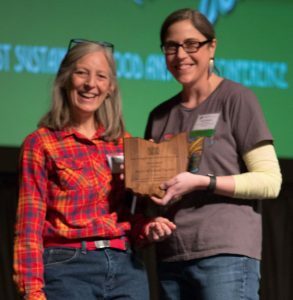 They received the Snail of Approval from Slow Food Cincinnati in 2018, were elected to Dorothy Lane Market’s Vendor Honor Roll, and have been featured in Edible Ohio Valley, Ohio Farmer, and Rural Life Today. Mike Hogan is a Franklin County Extension Educator and Associate Professor in the College of Food, Agricultural, and Environmental Sciences at The Ohio State University (OSU), specializing in urban agriculture, local foods, sustainable agriculture, small farm management, marketing, and food safety. He has spent his 32-year career working with sustainable, alternative, organic, and small-scale farmers. For the past several years, he has focused on increasing urban food production and food access in Columbus. As Co-Coordinator for the Ohio U.S. Department of Agriculture (USDA) Sustainable Agriculture Research and Education (SARE) program for the past 21 years, he has helped train agricultural professionals in sustainable practices, disseminated SARE research and project results, and promoted the availability of SARE resources. For more than a decade, Hogan has partnered with OEFFA on the Ohio Sustainable Farm Tour and Workshop Series, and has offered regular workshops as part of the organization’s annual conference. Larry and Cynthia Ringer, Stark Co.
Larry and Cynthia Ringer founded Ohio Earth Food in 1972 with Cynthia’s family, in the midst of the chemical agriculture boom. At the time, they were working on the vegetable farm of Cynthia’s dad and early organic farmer, Glenn Graber. After observing the benefits of kelp and concerned about the effects of conventional farming on the environment and human health, they realized there could be an emergent market for organic fertilizers, and started selling kelp products and rock phosphate. Larry and Cynthia started the company on the Graber farm in Hartville, where they’ve lived for more than 70 years. Today, Ohio Earth Food has expanded to sell custom fertilizer blends, feed supplements, natural pesticides, potting soils, and other products to customers throughout the U.S. They retired in 2010, but remain involved in the business as consultants. They have been active in OEFFA since its beginning. 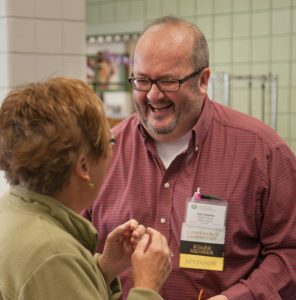 Larry served seven years on the OEFFA certification committee and has taught conference workshops, and Ohio Earth Food has been a fixture at every OEFFA conference trade show for nearly 40 years. Sean McGovern has been the National Outreach Manager at the Sustainable Agriculture Research and Education (SARE) program since 2004. There, he helps to educate farmers and agricultural professionals about the results of SARE-funded farmer-led research projects; develop educational partnerships between organizations, educators, and producers; evaluate the impact of programs, and develop and improve SARE communications and database tools. Sean has worked at OEFFA since 1994, continuing as an OEFFA employee in his capacity with SARE. He was first hired by OEFFA as a part-time secretary, about a year after graduating from Ohio State University. As OEFFA grew, Sean’s title shifted to Executive Administrator and eventually to Executive Director. He worked to develop productive partnerships with Ohio State University Extension and advocated for the creation of a new Organic Food and Farming Education and Research (OFFER) program, leading to the first organic production research at OSU. He focused on providing affordable educational programs that OEFFA’s members wanted, growing the membership base, and putting administrative systems in place that facilitated future growth. 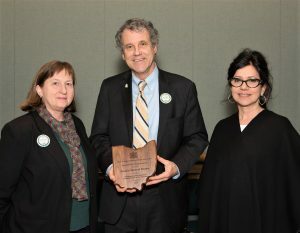 Senator Sherrod Brown has been committed to sustainable agriculture and a leader in making positive investments in local food systems, community economic development, and public health. Senator Brown has consistently supported investments in local and regional food systems that contribute to farmer viability, create jobs, and improve public health. Through his introduction of the Local Food and Regional Market Supply (FARMS) Act (S. 1947), we can fully develop the policies and programs that spur economic development in communities in Ohio and throughout the nation. Senator Brown’s farm bill advocacy efforts have supported more than 90 food system projects and resulted in more than $7 million dollars in investments in Ohio’s communities. He serves on the Senate Agriculture, Nutrition, and Forestry Committee, where he has been instrumental in strengthening the farm safety net and addressing childhood hunger. For 25 years, Mike Anderson of Delaware County has given his time and energy to Ohio’s organic farming community. 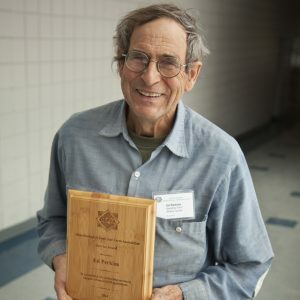 He began his farming career at the Ohio State University demonstration farm, then housed at the Ohio Department of Agriculture, before managing vegetable production and field research for five years at the Stratford Ecological Center in Delaware. In 2001, he started Sundog Specialty Crops in Sunbury, a certified organic farm specializing in produce and cut flowers. Today, Anderson co-manages Whitebarn Organics, a certified organic farm in New Albany. 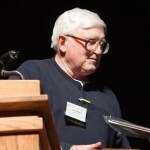 Throughout his entire career, Anderson has generously shared his time and expertise with other growers and with OEFFA. He served on OEFFA’s Board of Trustees in the 1990s, coordinating procurement of local food for the annual conference and planning farmer training workshops. 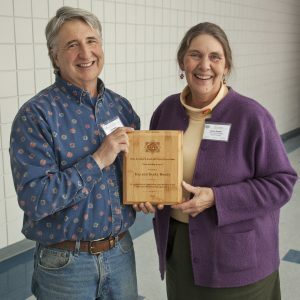 Later, he served on the board of directors for the Pearl Alley Growers Association, on the administrative council of the NCR-SARE program, and on OEFFA’s staff as a Sustainable Agriculture Educator, helping organic and transitional farmers with their certification, production, and marketing questions. Anderson has hosted numerous farm tours and has led many workshops at the OEFFA conference and other events to share what he knows with other farmers and grow Ohio’s sustainable agriculture community. Holly Harman Fackler, Fairfield Co.
Holly Harman Fackler, a Fairfield County native who lived for 30 years in Richland County, was an important influence and leader in the early days of OEFFA, acting as the organization’s first paid newsletter editor and employee. 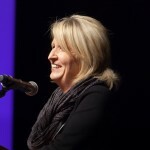 During the late 1980s and 1990s, she stepped up to do some of the heavy lifting required to build the then-fledgling organization into the state-wide, 4,325 member educational network it is today. For several years, Harman Fackler’s home in Plymouth, Ohio, was OEFFA’s office and her phone was OEFFA’s phone. She wrote, edited, designed, and distributed OEFFA’s newsletter, labeling and bundling newsletters at the dining room table, often with a young one on her knee. In addition to her work on the newsletter, she built OEFFA’s first electronic membership database from paper files kept on index cards, responded to phone and mail inquiries, and networked with other OEFFA leaders. She served several terms on OEFFA’s Board of Trustees, helped organize OEFFA’s educational events, and took an active role in planning and preparing conference meals that reflected the values of the organization. Harman Fackler worked as a reporter, blogger, editor and online editor, retiring in 2015 from Media Network of Central Ohio. Now she works, gardens, and volunteers in her hometown of Baltimore, Ohio. Alex Dragovich, Mud Run Farm, Stark Co.
Alex Dragovich of Mud Run Farm in Stark County has been a strong and guiding presence in OEFFA’s policy work since the program was formed in 2011, serving actively on OEFFA’s grassroots policy work groups and often speaking with the media and decision-makers about the impacts of fracking, climate change, food safety regulations, and genetic engineering on farmers. As a member of the fracking work group, which is focused on protecting farmers and our food system from the negative impacts of the oil and gas industry, Dragovich was literally the face of the issue when he agreed to work with a partner organization in representing farmers on a fracking billboard in southeast Ohio. He has experienced the issue first-hand; he has been approached by several companies with fracking lease offers, but has refused to sign a lease. As a member of OEFFA’s genetic engineering (GE) work group, which works to secure clear and transparent labeling for GE foods and protect farmers from GE contamination, he organized and hosted a showing and discussion of the documentary, GMO OMG, and made calls to Senate candidates about their stance on GE labeling. Since 1980, he has owned and operated Mud Run Farm, where he raises free-range chickens and eggs and grows vegetables, fruit, and small grains for local markets. His farm is powered mostly by horses, in part because he is concerned about climate change and wants to reduce his carbon emissions. Jim Croghan, Croghan’s Organic Farm, Clinton Co.
A pioneer in the organic movement, Jim Croghan was one of Ohio’s first certified organic farmers. At Croghan’s Organic Farm, Jim and his wife Joyce produced organic corn, beans, spelt, hay, and other grains for domestic and international markets. He retired in 2009 after more than three decades of farming, but continues to garden and maintain an orchard. His quiet, behind-the-scenes leadership within OEFFA led to the creation of what is today the organization’s Grain Growers Chapter, which remains very active. Before the National Organic Program was established—which set federal standards for organic certification—Jim also served on OEFFA’s board and certification committee, including a term as chairman, helping to shape OEFFA’s organic standards. A steward of both the organization and his land, Jim has kept his farm in continuous organic production since the late 1980s. 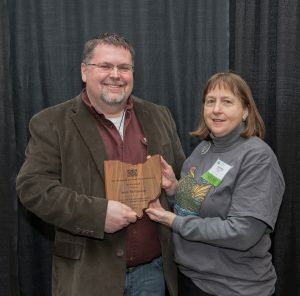 In 2010, organic farmer and OEFFA Little Miami Chapter president Jeff Harris began farming the land, growing organic alfalfa, yellow corn, soybeans, wheat, red clover, triticale, and rye. Sylvia Upp and Steve Sears, Pike Co.
Sylvia Upp operated the OEFFA Certification program from 1991 until 2007, joined by her husband Steve Sears in 2003. Together, they managed the complex and challenging transition from the standards and processes developed by OEFFA’s grassroots certification program to federal oversight once the National Organic Program became effective in 2002. Their home and farm in West Salem, Ohio served as the headquarters for OEFFA’s Certification program, until it moved to a Columbus office in 2007. Prior to his certification role, Steve served on OEFFA’s board for many years, during a time when the organization was largely volunteer-run. During this time, Steve also operated a business called Ohio Farm Direct, one of the state’s first wholesale distribution services that delivered products from farms to consumers. Bill Dix and Stacy Hall, The Brick Dairy Farm, Athens Co. In 1992, Bill Dix and Stacy Hall started Big Rumen Farm, a 300 acre pasture-based dairy farm in Athens County with a small herd of Jersey heifers and a milking parlor. Bill and Stacy also purchased a second farm outside of Albany, called The Brick Dairy Farm, named for its red, clay soil which had been degraded after years of conventional production. By focusing on grazing rather than confinement, the couple has been able to build top soil and make the land productive. Smart business people committed to creating change in their local community and in the dairy industry, they worked with Warren and Victoria Taylor to create Snowville Creamery in 2007, a small-scale dairy processing plant located on The Brick Dairy Farm. Fresh, grass-fed milk from Bill and Stacy’s 250 cross-bred dairy cows is minimally processed and packaged on-site. Today, Snowville’s milk, yogurt, and other products are available in more than 125 retail locations. Long-time OEFFA member John Sowder of Columbus served on OEFFA’s Board of Trustees from 1992 to 2015, including many terms as Treasurer. John helped to grow OEFFA, develop new administrative systems, and provided dependability and financial guidance during lean years in the organization’s history. He regularly lends his catering and event management skills to OEFFA, helping to organize farm-to-table events and OEFFA’s conference meals, which are locally sourced and made from scratch. He can be found each year in the kitchen at the OEFFA conference, where he helps to serve more than 2,000 meals to attendees. He has also helped encourage his peers within Ohio’s catering and food industry to serve more local food from Ohio producers. Kip and Becky Rondy, Green Edge Organic Gardens, Athens Co.
Kip and Becky Rondy own and operate Green Edge Organic Gardens, a 120 acre certified organic farm in Amesville, Ohio. Migrogreens, salad mix, mushrooms, greens, and other produce are grown year-round using 10 high tunnels and sold at the Athens Farmers Market, two summer and winter community supported agriculture programs which serve more than 400 families, and at stores and restaurants in Athens and Columbus. The farm, primarily tended by hand, employs 13 people, in addition to interns. One of Ohio’s most successful year-round farms, Green Edge Organic Gardens has partnered with Rural Action to provide workshops on high tunnel operation and with the Department of Mechanical Engineering at Ohio University to develop designs for internal covering and venting systems in high tunnels. Ed Perkins, Sassafras Farm, Athens Co.
Ed Perkins owns and operates Sassafras Farm in New Marshfield with his wife, Amy Abercrombie. They grow chemical-free vegetables, herbs, and berries on 2 acres, which are sold year-round at the Athens Farmers Market. A graduate of Ohio University with a Masters degree in botany, Perkins purchased his farm more than 40 years ago and has been an integral part of the Athens local foods community ever since. His regular Our Home column in The Athens Messenger has helped to educate thousands about environmental issues. As one of OEFFA’s most long-standing and active chapter presidents, Perkins hosted and organized local farm tours, potluck meals, and other chapter activities, helping to establish a strong link between OEFFA and the vibrant Athens local food movement. Mardy Townsend, Marshy Meadows Farm, Ashtabula Co.
Mardy Townsend raises grass-fed beef cattle at Marshy Meadows Farm in Ashtabula County, near Windsor, Ohio. Marshy Meadow Farm’s land has been certified organic through OEFFA since 1996 and the beef herd is in transition to organic. Townsend graduated from Wilmington College in 1978 with a degree in animal science and biology and received a master’s degree in agronomy from Ohio State University in 1997. She was a horticulture agent at the OSU Extension Geauga County office from 1994 to 1996. 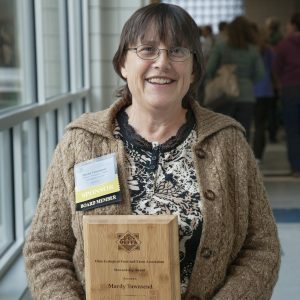 Townsend has served on the OEFFA Board, along with two stints on the North Central-Sustainable Agriculture Research and Education (SARE) Program Technical Review Committee. She is a founding member of OEFFA’s Lake Effect Chapter and has hosted several OEFFA farm tours. Rev. Charles Frye, Ashland Co.
Rev. Charles Frye served on the OEFFA Board for more than 30 years and has held both the President and Vice President offices. Frye is a retired United Methodist Church pastor who served local churches for 37 years. 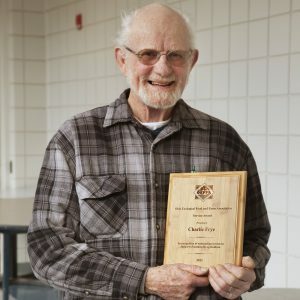 Frye began his involvement with OEFFA after spending seven years of his ministry life involved with the Rural-Urban Gardening Project, creating community gardens by encouraging collaborations between diverse communities. He and his wife, Rev. Nancy Hull live on 40 acres in Ashland County, which includes a garden and 40 heirloom fruit trees, blueberries, and asparagus plants. Frye and his wife are the parents of a blended family with nine living children and fourteen grandchildren. 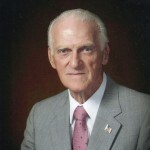 He received his bachelor’s degree in psychology and sociology from Kent State University in 1955 and a master’s in theological studies from Perkins School of Theology in 1958. Doug Seibert and Leslie Garcia, Peach Mountain Organics, Greene Co.
Doug Seibert and Leslie Garcia of Greene County have farmed organically at Peach Mountain Organics since 1992, growing certified organic mixed vegetables, microgreens, fresh-cut flowers, mushrooms, hay, and greenhouse plants. 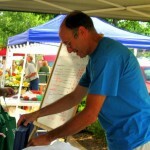 They sell their products at the Yellow Springs Farmers’ Market, local restaurants, and grocery and health food stores. Peach Mountain Organics has two farm sites and one half acre greenhouse location in Spring Valley, Ohio. Altogether, the operation is 43 acres, more than 25 of which are certified organic. 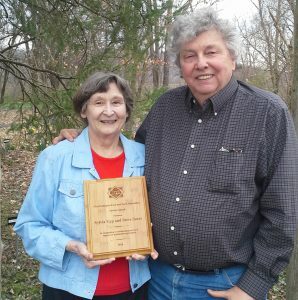 Doug and Leslie have helped organize group seed and potato orders for other farmers and grown organic bedding plants for other growers, hosted farm tours, presented OEFFA conference workshops, and were involved in the creation of both OEFFA and the Federation of Ohio River Cooperatives. Deborah Stinner, Wayne Co. Edward Snavely, Curly Tail Organic Farm, Knox Co.
Dr. Deborah Stinner is a retired research scientist and administrative coordinator for the Organic Food and Farming Education and Research (OFFER) program at The Ohio State University’s Ohio Agriculture Research and Development Center (OARDC) in Wooster, Ohio. Stinner’s research specialty is organic farming systems, with a focus on specialty small grains for artisan bread and pasta products. 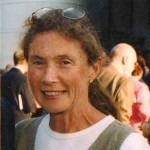 She helped found the OFFER program in 1998 to provide science-based information to Ohio’s organic farmers. Today, OFFER is internationally recognized as a leader in organic farming research and maintains 50 acres of certified research land and 20 organic field experiments. 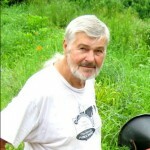 Ed Snavely owns and operates Curly Tail Organic Farm, a 114 acre farm in Fredericktown, Ohio. One of Ohio’s longest continuously certified farms, Snavely has been certified organic since 1989 and raises pastured pork and feed for livestock. Snavely has been a member of OEFFA since 1989 and currently serves on the Board of Directors as the Grain Growers Chapter Representative. He has served as President of the Organic Crop Improvement Association (OCIA) Ohio Chapter, and also as a former board member of OCIA. 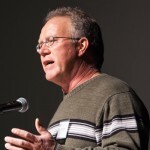 Snavely has hosted numerous farm tours; spoken as a featured presenter at OEFFA, OCIA, and American Livestock Breeds Conservancy (ALBC) meetings; and has been an honored delegate at the first and second Slow Food Terra Madre conferences in Italy. Mike Laughlin, Northridge Organic Farm, Licking Co.
Mike Laughlin and his family operate Northridge Organic Farm, a 20 acre certified organic farm, producing a variety of seasonal produce, specializing in heirloom tomatoes and Tunis sheep. Laughlin has been a part of OEFFA since the 1980s. He served as the certification committee chair for three years and helped write OEFFA’s first standards for organic certification. Laughlin founded OEFFA’s Heart of Ohio Chapter, and served as the chapter’s president twice. From 2005 to 2009, Laughlin served as President of OEFFA’s Board of Directors. Today, he serves on OEFFA’s Board as an At-Large Representative. Rich Tomsu, Rich Gardens Organic Farm, Athens Co.
Rich Tomsu, with wife Ann Fugate, own and operate Rich Gardens Organic Farm. Certified organic since 1989, Tomsu raises a variety of vegetables, including garlic, using biointensive farming practices. He has been a vendor at the Athens Farmers Market since the 1980s and has been instrumental to its growth. 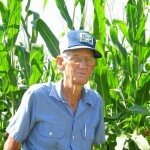 In 2002, Tomsu received the Ohio Small Farmer Award from the Athens Soil and Water Conservation District for the conservation practices on his farm. Stan Gregg, Gregg Farms, Knox Co.
Stan Gregg’s agricultural heritage stems from deep roots in Knox County where he and his wife Wilma are the sixth consecutive generation to steward the family plot. With the exception of three years during service in WWII as a Air Corps pilot, he spent his entire life on Gregg Road tending to diversified crop and livestock operations. Building and incorporating organic matter into the soil, and implementing corn, hay, soybean and small grain rotations with grazing lots for livestock, Gregg became certified organic in 1985. Gregg passed the farm to his son, Randy and wife Nancy, who maintain organic certification on one of Ohio’s first certified organic farms. Molly Bartlett, Silver Creek Farm, Portage Co. Mick Luber, Bluebird Farm, Harrison Co.
Molly Bartlett, and husband Ted, owned Silver Creek Farm, which was first certified organic in 1989. On this 75 acre farm, the Bartletts raised vegetables, blueberries, mushrooms, sheep, and poultry. Farm products were sold to restaurants and grocers, at farmers markets, and through a CSA Bartlett started in 1991. 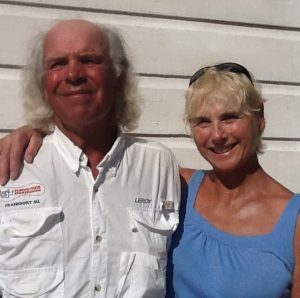 In 2007, the Bartletts retired to Florida and sold their farm to the Western Reserve Land Conservancy, ensuring the land will continue to be farmed sustainably. Bartlett has served as OEFFA’s Board President, helped create the OSU Sustainable Agriculture Team, and served on the advisory committee of USDA SARE’s Sustainable Agriculture Network. 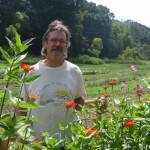 Mick Luber of Bluebird Farm raises certified organic vegetables and flowers, specializing in lettuces and garlic. A long-time member of OEFFA, Luber served on OEFFA’s first Board of Directors and as President for two years. He purchased OEFFA’s first computer and published the organization’s first newsletter. He also helped write OEFFA’s first set of organic standards, years before state or federal standards were established. Luber continues to serve as an organic farm inspector. Harv and Pat Roehling, Locust Run Farm, Butler Co.
Harv and Pat Roehling have raised certified organic vegetables on Locust Run Farm since 1987. The Roehlings have been actively involved in OEFFA for more than 20 years. During that time, Harv has served on OEFFA’s Board of Directors as Treasurer, President, and Vice President and Pat served as Secretary. 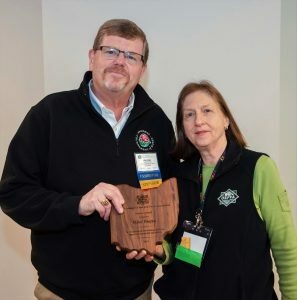 The Roehlings were instrumental in forming OEFFA’s Miami/Oxford Organic Network (MOON) Chapter and Harv continues to serve as the chapter’s president. The Roehlings have led workshops at OEFFA’s conference and hosted farm tours. 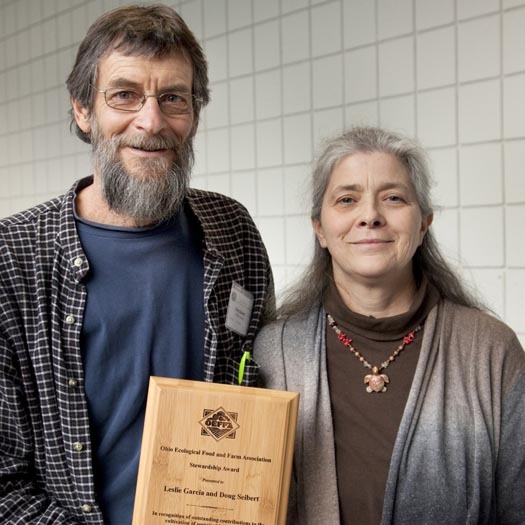 Additionally, the Roehlings were instrumental in forming the OSU Sustainable Agriculture Team, developing the Center for Small Farms at the Farm Science Review, and served as part of the farmer advisory group for the OFFER program at OSU. Pat Roehling passed away in 2008. Rex Spray, Spray Farms, Knox Co.
Rex Spray was Ohio’s first certified organic farmer, and an early pioneer for sustainable agriculture, inspiring a whole movement of organic farmers in Ohio. Spray grew certified organic soybeans, corn, wheat, hay, and beef cattle on 680 acres. He also built a bean cleaner and grain cleaner, to prepare and bag beans for tofu, adding to the farm’s profitability. 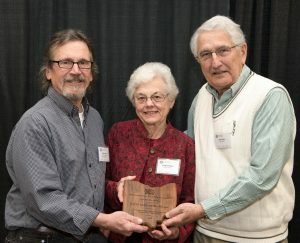 A tireless innovator and one of Ohio’s greatest examples of profitable, sustainable farmers, Rex Spray received the NCR-SARE 2006 Patrick Madden Award. He passed away in December 2011. 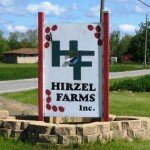 John Hirzel, Hirzel Farms, Wood Co.